Backflow and Cross Connection - The City of Ridgefield, Washington | Forward Thinking. Rooted in Tradition. 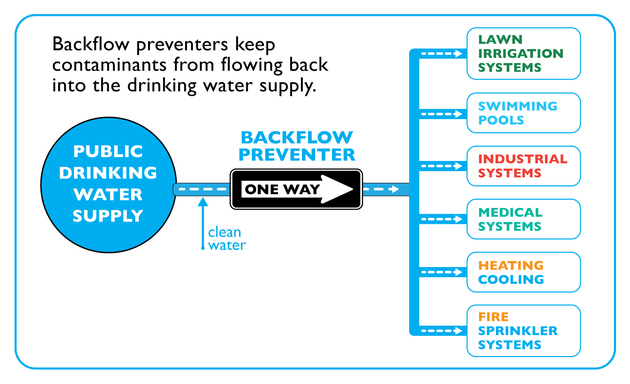 Backflow means the reversal of water flow from its normal or intended direction of flow. Whenever a water utility connects a customer to the utility’s distribution system, the intention is for the water to flow from the distribution system to the customer. However, the flow of water could be reversed from the customer back into the distribution system. If cross-connections exist within the customer’s plumbing system when backflow occurs, then it is possible to contaminate the public water supply. There are two types of backflow — backpressure backflow and backsiphonage. Backpressure backflow occurs when the pressure of the nonpotable system exceeds the positive pressure in the water distribution lines; that is, the water pressure within an establishment’s plumbing system exceeds that of the water distribution system. For example, there is a potable water connection to a hot water boiler system that is not protected by an approved backflow preventer. If pressure in the boiler system increases to a point that it exceeds the pressure in the water distribution system, a backflow from the boiler to the public water system may occur. A downstream pressure that is greater than the potable water supply pressure causes backpressure backflow. Backpressure can result from an increase in downstream pressure, a reduction in the potable water supply pressure or a combination of both. Boiler pumps, pressure pumps or temperature increases in boilers can create increases in downstream pressure. Reductions in potable water supply pressure occur whenever the amount of water being used exceeds the amount of water being supplied, such as during water line flushing, fire fighting or breaks in water mains. Backsiphonage occurs when there is a partial vacuum (negative pressure) in a water supply system, which draws the water from a contaminated source into a potable water supply. The water pressure within the distribution system falls below that of the plumbing system it is supplying. The effect is similar to siphoning or drinking water through a straw. For example, during a large fire, a pump is connected to a hydrant. High flows pumped out of the distribution system can result in significantly reduced water pressure around the withdrawal point. A partial vacuum has been created in the system, causing suction of contaminated water into the potable water system. During such conditions, it is possible for water to be withdrawn from nonpotable sources located near the fire — for example, air-conditioning systems, water tanks, boilers, fertilizer tanks and washing machines — into buildings located near a fire. The same conditions can be caused by a water main break. Garden hoses, toilets or similar devices create most household cross-connections. Under certain conditions, the flow in household water lines can reverse and siphon contaminates into the water supply. A toilet installed incorrectly without a “plumbing-code approved” toilet ballcock (air gap) will allow contaminated water to backflow to other water outlets in your house, including the kitchen sink. A backflow preventer is a method or mechanical device to prevent backflow and provides a physical barrier to backflow. As a courtesy, our public works department sends reminder letters when it’s time to have your backflow assembly tested. In addition, a copy of the City Approved and Certified Backflow Testers for the current year is included. Please note, this list is provided as a convenience only and is not intended to endorse or recommend a particular service. View Ridgefield’s Approved Backflow Test Report Form. The City will only accept tests submitted on this form. If you have or are planning on installing an irrigation system, you must first comply with state and local laws. These laws require that all irrigation systems have approved backflow protection. A plumbing permit is also required when installing an irrigation system. Without proper backflow protection, your irrigation system could endanger the health of your family, neighbors, and others in the community who are using the public water supply system. Backflow into a public water system can pollute or contaminate the potable water in that system (i.e., backflow into a public water system can make the water in that system unusable or unsafe to drink). Water suppliers and consumers have a responsibility to provide water that is usable and safe to drink under all foreseeable circumstances. The City of Ridgefield Public Works Department recommends contacting a licensed plumber. I am a renter. Why did I receive a letter about the backflow preventer? If you are renting a home or commercial space, your landlord or property management company would be responsible. In some cases, there may be an agreement between the landlord and tenant where the tenant is responsible. I received a letter to test my backflow preventer at a home/property I sold previously. How do I update my information? per (WAC 246-290-490) and (RMC 13.55.010). Generally, about 45 days prior to the test due date, the Public Works Department sends letters to all customers who are required to test their backflow assembly devices. Do backflow testers work for the City of Ridgefield? No. Backflow testers are independent private contractors. The City of Ridgefield does not install or test backflow assemblies. The State of Washington requires backflow tests to be performed by Certified Backflow Testers. View a list of City Approved and Certified Backflow Testers. This list is updated in the Spring of each year and requires testers to provide current year certifications. In addition, the approved tester’s must obtain a city business license if they are performing services within the Ridgefield city limits. Tests performed and submitted by someone not on the city’s approved and certified backflow tester list will be rejected and considered invalid. Residential customers are only required to install a backflow preventer if there is a potential cross-connection hazard. It is the customer’s responsibility to notify us if an irrigation system or pool is installed. Backflow requirements vary for commercial/industrial customers based on the business’s water use. Ridgefield’s staff reviews newly established commercial/industrial water accounts to assess the degree of backflow hazard and notifies businesses about backflow requirements. To eliminate these backflow requirements, the irrigation system must be physically disconnected and removed from your plumbing system. Contact a certified backflow tester to schedule the removal and notification to the Cross-Connection Control Coordinator (360) 857-5010. Public Works will schedule an inspection to confirm the backflow assembly has been removed and capped off.